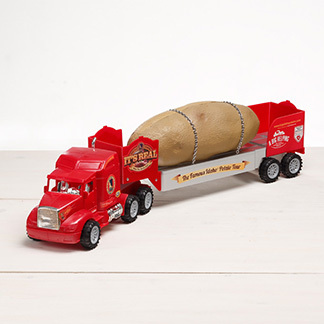 The Potato Team started their week with an OORAH! Monday morning they marched on to the Army Base of Fort Campbell, Kentucky, eager to be put to the test in the grueling military obstacle course! The group halted in front of the Commissary and as the event trudged on, their eager muscles grew ever antsy for the ropes and wooden hurdles awaiting them. At 11:59 they eyed the clock….5..4..3..2..1..0!! The team made a b-line for the course! A passing soldier spotted the team sizing up the intimidating course and offered his knowledge. He explained how the course should be completed and the guidelines the squads must follow throughout the challenging passage. The soldier was definitely not going to pass up the opportunity to go head-to-head with Ellis through a section of the course. They both wrapped their fingers around the hanging ropes and bent their knees, ready to climb at the first sound of Kaiti’s signaling voice. “Go!” They ascended the thick ropes, neck and neck. Reaching the top, they raced across wide spaced logs and climbed even higher on two inclining ladders. They swung over the top of the course and hurried down a web of woven rope, racing towards the ground. Ellis’s feet slammed into the ground, victorious! Everyone congratulated the champion (though they all suspected the soldier just went easy on him). 😉 The team lingered awhile longer trying their hand at various obstacles. Soon the blazing sun became overwhelming and the team continued their trek to Louisville. 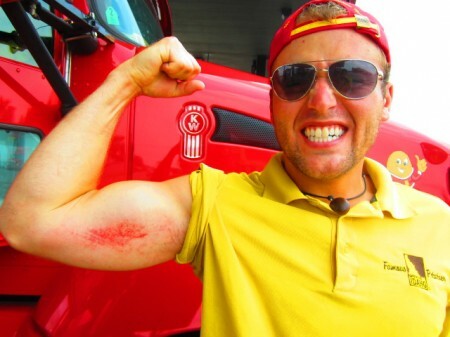 The "battle wound" Ellis suffered from winding through wooden beams. Louisville, Kentucky, sound familiar? You’re right! It was the team’s second trip into the city. As the tour has wrapped up the East coast the team is making their way back across the country! The reunion with the city was warm and loving though the stop was short. The team had a quick event at a local Walmart then packed up and covered over three hundred miles of pavement to land in Memphis, Tennessee! The fantastic trio tried to eat as little as possible Wednesday night, in preparation for the filling day to come. They woke Thursday morning with the thought of Huey’s mouthwatering burgers dancing in their heads. 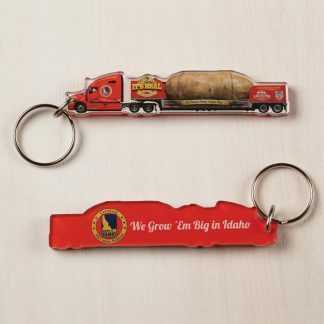 Huey’s has been a loyal Simplot customer for over twenty years, serving only the best Idaho potato fries to all of Memphis! 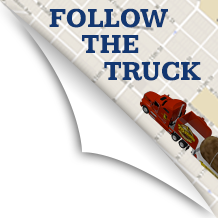 In celebration of the big spud’s visit, Huey’s gave out FREE fries to anyone who ordered a burger or sandwich! 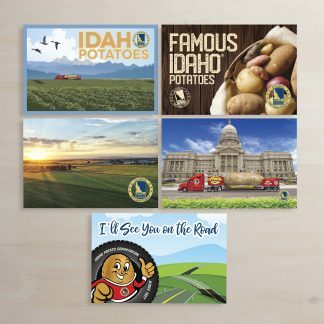 The customers were all too eager to get their hands on some free Idaho fries! Leaving Huey’s, uncomfortably full, they headed on to Garibaldis Pizza! Garibaldis famous Idaho potato pizza made it an essential stop for the team. The chewy crust was topped with a brush of garlic butter, mashed potatoes, bacon bits, cheese, and red onions making it a delectable combination. Though contrary to what you may have thought, the food didn’t stop there! Howard Steed of J.R Simplot Company graciously took the tater team to a superb steak dinner at Folks Folly! Four hours zoomed by and the team was ready to be rolled from the restaurant and sink into their feathered beds. 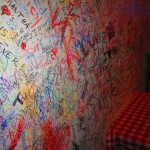 Every Huey’s guest gets to contribute their own mark to the wall! 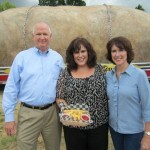 Howard Steed from Simplot and two of the three sisters that own Huey's , showing off some delicious Idaho fries! The team with Mr. Garibaldi himself!! Saturday afternoon, while transitioning between events, the trio spotted a very..unique..opportunity. 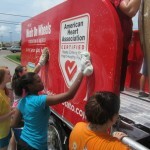 The marching band of Lewisburg High School was putting on a local car wash to raise money for their band. The truck was rather filthy and needed a good scrub down. What better way to make sure the students were working for their money? 🙂 Getting the idea approved by the team of course, Paul pulled the truck in to get a sparkling shine! 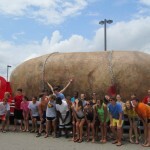 It’s safe to say the Lewisburg marching band earned a special place in the hearts of the tater team. 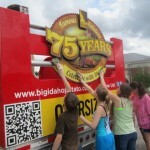 The group pulled into the parking lot of their next event with a truck shining like the sun! Lions, and tigers, and bears, oh my! Sunday afternoon was spent exploring one of the highest ranked zoo’s in the country, Memphis Zoo! The team gawked and laughed at the various exotic animals that filled the zoo. 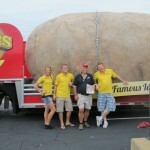 With another relaxing day come and gone, the Famous Idaho Potato Tour is ready to take on St. Louis. The only question that remains is simple; are they ready?